The Fuller Center Bicycle Adventurers momentarily paused their journey to the southern coast in order to learn as much as possible about the rich history of the affordable housing movement in Americus, Ga. The bikers arrived in Americus Saturday, Aug. 8 and were welcomed by many friends and supporters. Church members and friends joined the bikers as they got closer to the Fuller Center. New photos! Click here for a gallery of photos from the journey. 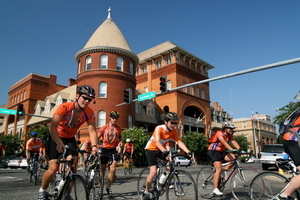 Continue reading and watch a video of the bikers’ ride into Americus. Sunday was meant to be one of two days of rest in their five-week trip. The bikers attended the church of former president Jimmy Carter in the morning. After lunch at Americus Mennonite Fellowship, they headed to Koinonia Farm, where the idea for Habitat for Humanity was born, for an extensive tour. And in the evening, they spent time at the home of Fuller Center co-founder, Linda Fuller. Monday they awoke early to begin build number seven of the eight house building projects planned for the trip. The 17 bikers swatted gnats and sweat as they scraped the old paint off the exterior of the home of Julia Tyner and her three sons. Tyner is receiving a Greater Blessing box repair on her home. It will eventually include new windows and other indoor and outdoor repairs. Her home is an Americus-Sumter County Fuller Center project. You can read more about Tyner and her family here. The bikers are aware that the end of the rode is near. “It’s been kind of surreal this summer. We’ve been through a lot but we don’t really want it to be over,” Goodwin said. “We should turn around and go back up to Michigan,” added Michael Tiemeyer of Auburn, Ala.
And don’t forget to check out photos from the entire trip here! To sponsor the riders, click here to donate.